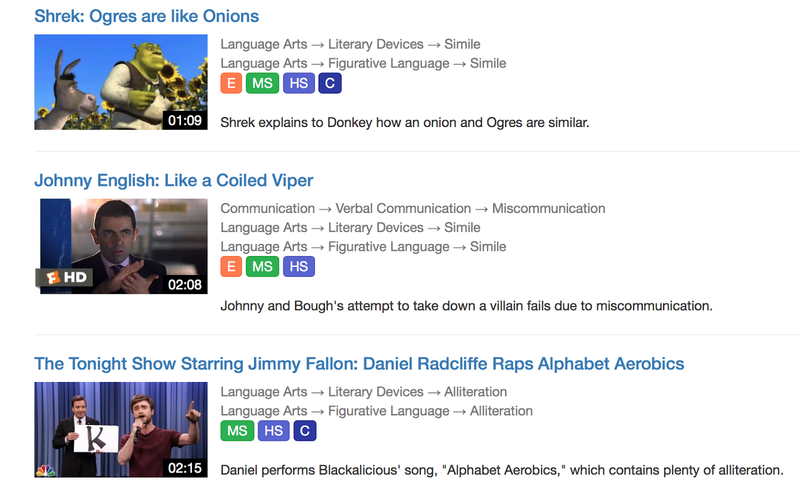 Classhook is a free service for educators that seeks to "hook" students with clips from popular culture (movies, TV, etc) that connect to academic concepts. I use video clips in many sessions to target narrative language as well as social cognitive concepts. Video is easy to access and naturally engaging to students, prompting observation, discussion and retelling opportunities, as well as post activities such as sketching or discussion webbing. Classhook has a wide range of topics in which videos are catalogued. SLPs and literacy specialists would naturally be interested in the English and Communication categories, but also should look at Psychology and other disciplines as well. Additionally, using videos to link to concepts in any curriculum area and constructing language activities around them is a good way to incorporate educationally relevant interventions. You can use Classhook on a laptop, Chromebook or a mobile device such as an iPad. I find it is a good practice to curate your own video links in a service such as Pinterest or Pocket.